From architecture to literature, from language to skiing, a look at Slovenia - the country that entered 1989 gradually turning its back on the Balkans. 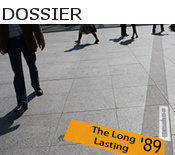 A contribution to our dossier The long lasting '89. Slovenia's prospects as a country suddenly changed in the eighties. But before that, it had proudly been anchored in Yugoslavia and the Balkans. After all, Ljubljana did not have any other alternative. According to Taras Kermanuer, a noted writer at odds with the regime, in order to survive as a nation then, the Slovenians had to turn their backs on Europe. Choosing sovereignty, they had gone against Central Europe and looked East: first towards Russia, and then towards Yugoslavia. In this way, they were "de-Europeanized" but used Yugoslavia as a tool of emancipation. A dramatic shift happened in 1985 during a secret meeting of Slovenian and Serbian intellectuals who the regime would have called "right-wing bourgeoisie". The gathering included also Dobrica Cosic. He was one of the more prominent members of the Serbian Academy of Sciences and Arts (SANU); a group that had already begun to ruminate on the "sad" destiny of Serbs in Yugoslavia. Nevertheless, in that period of time, Slovenians were rapidly distancing themselves from the Balkans and trying to grasp onto something else. Writers in Slovenia, who considered themselves the real guardians of the nation, reflected on the "sweet death" of the Slovenian people, and of Central Europeans overall. It was a continuation of the debate launched by Milan Kundera and his theory of the disappearance of Mitteleuropa. But parlor small talk took place in a changed social climate. In Slovenia, like elsewhere in the federation, the economic crisis took a heavy toll. Given their geographic position, Slovenians were well-placed to compare the Yugoslav standard of living and that of the "decadent" West. The empty shelves in the federation stood in stark contrast to those filled with anyone's heart's desire in Trieste or Klagenfurt. And there were other things too. Ljubljana was rediscovering Jože Plecnik, the architect who had redesigned the capital in the postmodernist style and who also left his mark on Prague. Until that point in time, his work was considered decadent. All of a sudden, the two cities that had both once been part of the same Austro-Hungarian empire were being compared. Reconciling with Mitteleuropa also meant growing distant from the Balkans. In addition, Slovenians felt rather annoyed by the influx of workers from the other Yugoslav republics. These migrants were considered people of poor culture and proponents of values different from those of Slovenians. They spoke a different language (Serbo-Croatian) and it seemed they had no intention of learning Slovenian or adapting to the way of life in the republic. In some ways, they were seen as instruments of the "Yugoslavisation" of Slovenia. The "brothers from the South", as they were called derogatively, represented an ephemeral threat. In reality, they were poorly-trained workers who did work Slovenians did not want to do. They found work on assembly lines or in construction. The increased public use of Serbo-Croatian deeply worried Slovenians. As a matter of fact, in the beginning of the eighties, the political leadership established Slovenian as the only official language in Slovenia and decreed that no form of bilingualism was possible. Harsh criticism was directed at public TV for failing to subtitle things said in Serbo-Croatian. University textbooks also came under attack because some specialized volumes were not available in Slovenian, forcing students to use books published in Belgrade or Zagreb. The intense focus on language also changed the behavior of politicians. Politicians increasingly came under attack for not using Slovenian enough in the federal bodies. Perhaps as a direct result of this, in May, 1988, amidst the Yugoslav crisis, the newly-elected President of the Federation, Janez Drnovšek, made his inaugural speech in Slovenian. It was something that had never been done before. On the social level, the repositioning of Slovenia towards Central Europe also happened through sports. A passion for skiing, already popular in the admired countries of Austria and Switzerland, began to emerge in the Seventies. Swedish champion Ingemar Stenmark started to win championships wearing skiis produced in a small Slovenian town. This brought pride to the national industry and allowed it to compete with the best producers in the West, and even win. That wave of success produced a fierce squad of skiers. 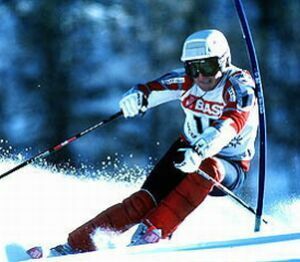 In 1980, Bojan Križaj won his first slalom title. The victory was welcomed in Slovenia with the enthusiasm typical of a victory at the world football cup. Skiing became a national sport and, during ski events, everyone flocked to watch the competitions on televisions and offices buzzed with transistors. The World Cup series, which played rounds in Slovenia, became an official national holidays livened with accordion-playing polka bands and the ubiquitous Kurenti (Ptuj type masks). Those athletes made Slovenians proud. The team was comprised of Slovenians and the language used was Slovenian. Of course, they competed for Yugoslavia, but those victories were perceived as achievements that were exclusively Slovenian. Naturally, the victories of the national Yugoslav basketball team were also celebrated and people suffered the matches of the awful national football team, but the joy was greatest when a skier won. Through skiing, the relationship between the "larger homeland", Yugoslavia, and Slovenia was reconciled. But this relationship (also in sports) was shattered by nationalist tensions in the federation and eventually dissolved in June of 1991. When Slovenia declared independence, the European basketball championship was under way in Rome. Yugoslavia was the undisputed favorite. Slovenian Jure Zdovc was on the Yugoslav team. The Slovenian political leadership asked Zdovc to leave the team when the military intervention started in Slovenia, so he quit. The final match was between Italy and Yugoslavia. In the stands, someone dared display a scarcely ominous banner reading "Unity to Yugoslavia, championship to Italy". In the end, the Italians lost the game and the federation fell apart.